You may have heard the cliché that football is a game of two halves and, indeed, we have written about the statistical differences between the first and second halves of individual matches before. But when it comes down to the essence of football betting systems, the keen observers amongst you will appreciate that every season is a season of two halves also. Many of the continental European leagues operate with a winter break: the German Bundesliga (18 teams – 306 matches) pauses for a month in late December of every year (the average German winter break was 31 days in the five seasons 2011-16); the Russian Premier League breaks for three months in early December of each year, and so on. Some leagues without a recognised mid-season break contain a natural break. The English Premier League (20 teams – 380 matches) is a good example. The league schedule here is for all Round 19 matches (halfway stage of the campaign) to be completed in the last few days of the calendar year. Round 20 always begins early in the new calendar year. But why is the impact of these breaks such an important consideration for the discerning bettor? Let’s first examine some of the more relevant differences between the two halves of a season. Before the start of any new season, the destinies of every team are completely unknown. Public opinion (punters, press, TV, betting companies, etc.) dictates that some teams are earmarked as potential title winners or challenging for Europe; others as relegation candidates; the rest a mixture of unknown quantities, or teams set for a season of struggles. In this way, matches are initially priced by the bookmakers based purely on the past performance of the teams involved. (There are no current statistics as the league hasn’t yet kicked-off). These prices are then adjusted based on the strength of public opinion. (In other words, according to the weight of money staked by punters). The initial odds-setting exercises are often wide of the mark. They are guesses based on what has happened in the past. It takes several rounds of competition before the real mix of potential title challengers and relegation candidates begins to take shape and odds settle accordingly. A classic example is the 5000/1 arbitrary price offered for Leicester City to win the EPL before the start of both the 2014-15 and 2015-16 seasons. 2014-15 saw them back in the EPL for the first time in 10 years with no relevant statistical form whatsoever. Surviving by the skin of their teeth was only good enough for bookmakers and punters alike to give them no chance again the following season. Having miraculously won the EPL title in 2015-16, they were lower than 60/1 with several bookies prior to the start of 2016-17, with only two seasons of relevant statistics behind them. Therefore, ante-post odds setting becomes a more reliable exercise as the season progresses, when more results are recorded by each team, and league position and form become more apparent. Many European leagues have a formal Winter Break out of necessity to avoid the worst of the winter weather. When you have lived in Berlin during a December day that plummets to -25°C, and experienced petrol and diesel freezing at -40°C and below during a Russian winter, it is easy to understand why! Most European leagues start in late summer. The first half of a season sees games played in gradually deteriorating weather conditions as summer enters autumn, and autumn enters winter. The second half of a season usually begins during or at the end of winter, continues through the following spring, and into the beginning of the summer. It’s a complete reversal of conditions, and each team will have their own regional variations to contend with as well. At the start of every season, for most teams in a league, there are fewer competitions to contend with. Most teams begin a season with a fully fit squad of players but a manager might not know his strongest team at the start. Squad rotation only becomes an issue for teams with large enough squads to rotate and is observed when teams wish to rest key players in less important games. Most of the EPL teams enter the League Cup in the last week of August, whilst those with European commitments have almost an extra month before League Cup duties commence. Invariably, one or two teams begin their seasons before the league campaign kicks-off. Pre-qualification games for the Europa and Champions Leagues begin as early as June. As a result of playing up to three two-legged competitive ties, these teams may already be more ‘match fit’ before commencing their league campaigns. The third round of the FA Cup is usually the first set of fixtures for EPL teams to face in the new calendar year. The 1st of January is, therefore, a natural split and heralds the start of the second half of the season in England. As players accumulate more game-time during a season, their chances of missing matches through injury or suspension naturally increase. It takes time for a totting-up suspension to attach to any player. In the EPL, the yellow card suspension system recognises the midway point of the season. Five yellows in the first half of a season lead to a ban. With up to four yellows to a player’s name, an armistice applies to allow him to continue playing in the second half of the season with the threat of a totting-up ban reset at the ten yellow cards mark. Therefore, with the rules of the game and the limits of the human body, it is therefore only natural that more suspensions and fatigue-related-injuries will occur later rather than earlier in a season. The more successful a team becomes the more games in a season that team will play and vice versa. Successful teams will subsequently tend to play more matches in the second half of a season. Games become ‘six-pointers’ towards the end of a season when there is something more definite to play for. Some squads become thinner as the season progresses, more so during the second half because of injuries, suspensions, African Cup of Nations call-ups, etc. Attitude towards cup competitions may change depending upon the league standing at the time of the club involved. Targets become more visible and tangible as competitions draw to a close. The attitude of ‘taking each game as it comes’ is replaced by a more focused approach as the prize money and the glory gets closer. Players with personal targets or seasonal records to achieve or maintain will, of course, be more incentivised the closer it gets towards the end of the season. E.g. Golden Boot and Golden Glove candidates. Teams experiencing managerial changes during the season will be affected in different ways. A relegation-haunted team may suddenly perform like champions-elect under their new manager. A different team may be doomed already and no amount of managerial changes can help. League position tends to be a psychological factor for everyone concerned. A cursory glance at the league table will lead punters to view teams at the bottom as generally weaker than those at the top. The pre-season transfer window is far longer than the mid-season window. If you know your football and have many seasons of observation under your belt, you will surely know in your heart that both halves of a season are entirely different from each other. Taking all of these factors into consideration it stands to reason that what happens in the first half of a season is likely to be totally different to how the second half pans out. The variables are different. The mentality of teams is different. Everything is different. With betting systems, what works well in the first half of a season may be totally inappropriate once the second half commences. The following graphic shows a great example from the Japanese J-League, and is based on flat stakes of 100 units per match. The left-hand graph shows the results of backing the home win in all 765 games during the first half of the five seasons 2012-16. (The first 17 rounds of matches in each season). The right-hand graph shows the same bet type for the 765 matches occurring in the second half of the same seasons. (The second 17 rounds of matches in each season). 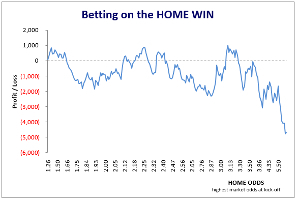 You can see quite clearly that backing the home win during the first half of each of the five seasons is unviable and leads to heavy losses – you are better off laying the home win. However, in the second half of the season, there are healthy profits to be made by backing it. Looking at the whole J-League picture for five full seasons reveals a more chaotic picture and one that tempts neither a backing nor laying strategy. As an aside, whilst Japan shows patterns which are typical of many leagues, it also has its peculiarities, such as being the home of the world’s oldest footballer, still playing professionally well into his fifties! More often than not, there will be different bet types applying to the first and second halves of the season. For example, it might be the underdog or away win during the first half of the season, and home wins and favourites in the second half. Sometimes, the same bet type applies to both halves of the season, just with slightly different parameters. You might be chasing favourites priced between 2.01 and 2.76 in the first half, and favourites priced between 1.89 and 2.56 in the second half. Every league is different. So, we have explained why and shown how each half of a season has its own patterns. Analysing both halves separately is usually a far more revealing method than analysing what happens in whole seasons. Whole season analyses tend to represent a blend of what has happened across both halves, rather than pinpointing what is likely to happen in each half. (Just ask the Russians – their winter break is so long that both halves might just as well be separate league seasons). However, some leagues just don’t have any recognisable break at all. In Europe, for example, the Finnish Veikkausliiga. M.L.S. in the United States is another example. For leagues such as this, it is sometimes better to analyse the season as a whole and forget about breaking it down into halves. These two leagues are examples of what we call ‘Summer Leagues’ – ones where the entire season is fitted into a single calendar year rather than bridging two as is the norm in the top-flight European leagues.